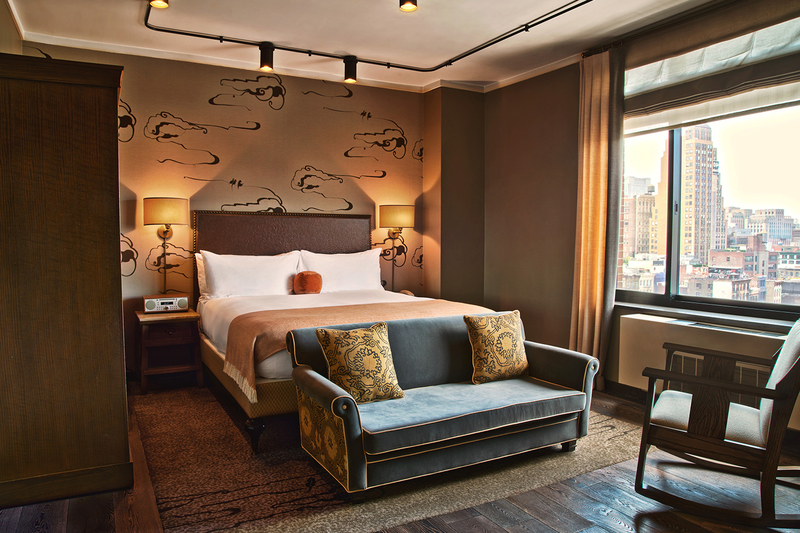 The Grand Corner King Terrace Room is the largest standard room at 350 square feet with a 600 square foot terrace boasting stunning SoHo views. Featuring oak floors, a custom king Englander mattress with down comforter and pillows, the Grand Corner King Terrace has enough room for a loveseat at the foot of the bed, as well as a solid oak rocking chair adjacent to double doors that open to a sprawling terrace. Other amenities include a Nespresso machine atop an expansive turn-of-the-century chicken wire glass top desk and a 65” Samsung smart TV while the industrial overhead lighting is a nod to the neighborhood’s rich history. The bathroom features white subway tile, a bathtub and New Yorker cartoonist Saul Steinberg-designed playful wall covering.